A military officer is brought into an alien war against an extraterrestrial enemy who can reset the day and know the future. When this officer is enabled with the same power, he teams up with a Special Forces warrior to try and end the war. Sci-fi action worth repeating. If you are into alien invasion and experimental thoughts about timelines, this is a good mix. I am a big fan of developement of characters through a story, and the transformation of Cage as he gets smarter is really well done here. In general the acting is pretty good from all sides. Nothing special, pretty good. The special effects and soundscape are good as well. I streamed this movie in HD on my home theater system, and the experience was quite good. Why are the aliens called mimics? It would make good sense, if they were actually mimicking humans or something like that, but I do not really see the connection here. Maybe I am just a bit dim? 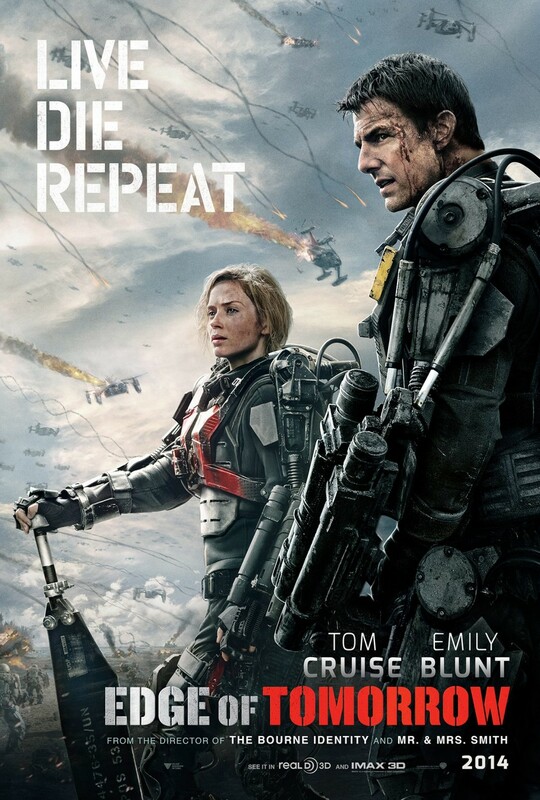 Edge of Tomorrow can easily be considered a solid action movie. If one does not go into plot details and the state of the world the movie takes place in, then everything makes sense and the "Groundhog Day"-approach really makes for nice pacing in futuristic take World War, where the common enemy is aliens. The best thing about the 'reapeating day'-feature is the development of Tom Cruise's characther Major William Cage. Starts with confusion, then the hope of actually being able to make difference and during the end all hope seems lost. You get the lonliness he's going through. Also important to mention that the characther setting and introduction of both Cruise's and Emily Blunt's is very clever. They never mention exactly how many times Cage re-experiences the same day, but from the feeling of it it is a lot of times. Which makes the idea a bit more epic than if it'd been 10-20 times. The special effects of the movie is very cool. The alien design are very cool. Especially the way the aliens move around(thinking about the Alphas here). Earth is invaded by aliens. The human race is forced to retreat. However, new technology might give the humans one last chance to win the war. This movie takes place in Europe. The movie clearly feels like an updated WW2 movie (France is occupied, and apparently only the UK has not yet been conquered by the aliens). The human counter offensive starts on a French beach (did anyone say D-Day in Normandy?). I like the movie’s European focus. We do not hear much about Russia and the US. However, the main point is that the human race must stand together despite national differences in order to defeat a common enemy. Tom Cruise has played this role a million times before, but his character develops significantly during the movie (because of a time loop he experiences the same day repeatedly). Emily Blunt is convincing as the elite warrior who helps Tom Cruise to defeat the aliens. Bill Paxton and Brendan Gleeson are also good in minor supporting roles. The humans’ key to victory is new powerful suits, which clearly increase the soldiers’ strength. Generally, the suits have a nice mechanical look, but I think the weapons look too overpowered. The landing on a French beach is not convincing. I do not understand why the gigantic suits have to fight the aliens in the sand. Where is the strategy in that? Still, the landing scene looks great with lots of explosions and gunfire. It makes me think of a computer game. The aliens in the movie look like electric octopussies (nothing special). However, they are clearly worthy opponents to the human power suits. The ending is too abrupt. I would like to see the aftermath of the war agains the aliens (this is a minor thing). “Edge Of Tomorrow” is no masterpiece, but it is still solid sci-fi entertainment.